The Cool-Flo pistonless pump operates under negative pressure so if a leak occurs, or if a tube is severed air will flow into the system, instead of coolant leaking out. Cool-Flo enabled servers retain the ability to air cool by using traditional finned heat sinks that are modified for Cool-Flo liquid cooling. Cool-Flo operates under negative pressure so if a leak occurs or if a tube is severed air will flow into the system, instead of coolant leaking out. The Cool-Flo No-Drip Hot Swap Connector automatically evacuates coolant from a server when it is disconnected from the system. Should a power loss or controlled shut down occur the pump system will immediately and automatically drain all the racks of coolant. Air cooling and automatic coolant evacuation allows servers and racks to be moved throughout the data center and function properly in all areas: liquid or air. Servers can be outfitted with liquid cooling capability and still operate with standard air cooling. 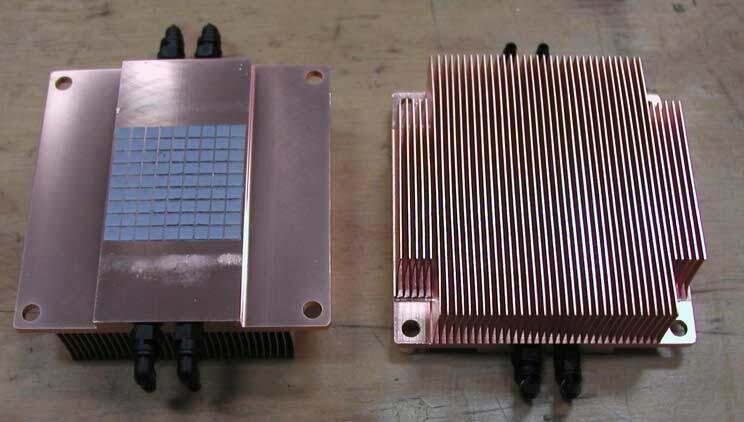 Utilizing standard finned heat sinks modified for liquid cooling, the Cool-Flo system retains the ability to air cool all servers in the data center. The server can still operate as a standard air-cooled system to minimize down-time. The Cool-Flo system is shipped dry and coolant is only deployed when connected to the main pump system via Chilldyne’s proprietary No-Drip Hot Swap Connector. Passages are drilled into the heat sinks and Cool-Flo Turbulators are installed. The heat sinks are then connected together with low-cost silicone tubing and installed into the server.